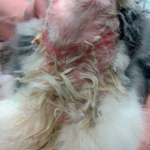 Here at the RWAF we are aware of 3 significant fatal viral diseases of rabbits in the UK. Myxomatosis (covered by the vaccine Nobivac Myxo-RHD); Rabbit Viral Haemorrhagic Disease 1 (covered by Nobivac Myxo-RHD), and Rabbit Viral Haemorrhagic Disease 2 (covered by the vaccines Filavac KC and V, or Eravac). We are not aware of any further versions of RVHD present in the UK, although the variant K5 has been discovered in Asia and Australasia. We are not aware of any viral infections that are acutely fatal to rabbits and rodents recently arriving in the UK. If anyone has documentary evidence of any exotic diseases arriving in the UK in future please inform us and the Animal Plant and Health Agency. 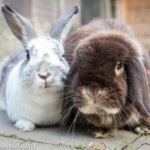 It’s Welfare Wednesday today and the first one of the month, so today we are featuring rabbits at two different rescues who are available for adoption. Here are photos and messages from the rescues, and hopefully, how you can contact them! 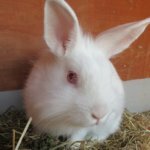 Just a note from us – how sad to read that 7 year old rabbits have spent their whole lives in rescue! Red eyed white boys are sticking as many people don’t like red eyes which is a shame as they are lovely lads! 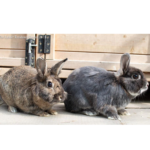 Timid and a bit short sighted but lovely natured rabbits. Both are vaccinated and neutered and approx 10 months old, small to medium size. Pictured are Bilbo and Baggins. we also have their brothers Frodo and Hobbit who is fluffier! Mariah & Amaru are 6 years old and would suit a spacious outdoor home as Mariah is half wild. cheeky pair suited to a quiet indoor or outdoor home. Mulder & Scully are 7 years old and have been in rescue their whole lives. They’re an adventurous pair who love to explore and are happy to interact with you once they get to know you. 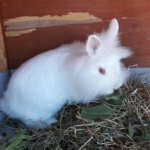 All of our rabbits are neutered and fully vaccinated, homes must exceed RWAF guidelines and we will rehome up to three hours away. 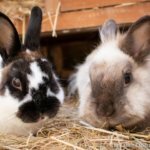 The Rabbit Residence Rescue (registered charity 1148016) is based on the Herts/Cambs boarders and is home to around 100 rabbits at any one time. We have a sponsor scheme for some of our long term residents who have not been rehomed due to health or behavioural issues and also offer a holiday boarding. For those of you that may be reading this for the first time, a quick reminder about our Capone Campaign. The online sale of pet rabbits is a huge problem and rapidly increasing. Rabbits are sold without any accompanying care advice and without any vetting of the buyer. Rabbits are probably the most misunderstood of pets, so when people take them on without knowing how to care for them it often results in neglect and suffering on the part of the rabbit. On top of this, because there is no vetting of the buyer, it is known that rabbits are bought not as pets but as live food or for use in animal training. Pet shops in the UK are licenced by their local authorities and subject to annual inspections. They are also public places and welfare standards front of shop can be monitored by the public who can report any concerns. Pet shops should also be licensed according to the Sale of Pets 1951 legislation, and according to the Model Licence Conditions that were updated in 2013. All of this doesn’t mean that there aren’t any problems in terms of welfare, but it at least provides some protection for the animals, and some legal recourse for concerned parties such as the RWAF. This is not the case with online sales. Anyone can breed animals at home and sell them online. This activity is not licensed and there are no inspections. It is not public and there are no model conditions to be adhered to. It is mostly cash based and therefore untaxed. 1 The RWAF and Pets Corner, using software developed by Hindesight, want to identify people who appear to be operating at home as pet shops and to capture their online activity. 2 To highlight these sellers to their Local Authorities and state that they be licenced and inspected as pet shops. We have guidance from DEFRA to support this. 3 To report these sellers to HMRC to ensure that they are paying the correct tax. 4 To ask that the classified sites register these sellers as commercial and not private accounts. 5 To keep a log of the reactions of every Local Authority and use this to report to the Minister for Animal Welfare at the end of the trial period to highlight where the legislation is not working and needs to be improved. 6 To lobby for improved legislation where the need is identified. 1 Identify unlicensed sellers, which are most likely going to be backyard breeders where welfare standards are poor. 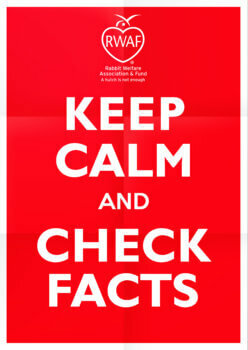 2 Make local authorities aware of the problems that unlicensed sellers cause. 3 Make it more difficult for these sellers to operate so that it is less appealing and less rewarding. 4 Uncover poor welfare standards that can then be reported to the RSPCA and action taken. 5 A log of responses and actions taken, or lack of, amongst Local Authorities. 6 A sound basis for lobbying for better welfare or resources in Local Authorities. We are now starting our third year of this campaign, and Mark Dron has been with us for just over 12 months. Because of his background in the Police force Mark has widened his role to include offences that breach trading standards, as well as welfare, he will explain more about this in his update below. Mark is keeping very busy using the data supplied by Hindesight and also complaints we get from supporters. 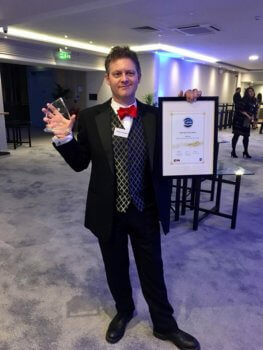 We are delighted that Pets Corner have agreed to fund Mark’s position for another 12 months. Mark is a huge asset to the RWAF and continues to push for better standards and welfare. Our thanks to Pets Corner for their support that has made this position possible. initiative for another year; my thanks to Pets Corner for their commitment to assisting with the growing effort to control unregulated internet sales of pet animals. “This has been a busy few months with plenty of reactive and proactive work to keep me occupied. 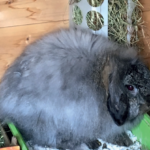 As a result of the complaints received, I have investigated and referred an active online trader based in Manchester to Salford City Council’s Environmental Health licensing team; this individual appears to have sold at least two rabbits for cash that subsequently very quickly succumbed to Myxomatosis. When challenged by the buyer, the seller denied all knowledge of the rabbits or the sale or indeed of any health issues amongst his animals. “My investigations have linked this seller to sales of rabbits of all types as well as guinea pigs and a diverse array of birds including budgies and chickens, across a wide range of sales platforms. 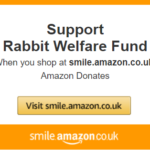 “As well as being a very sad story since one of the newly purchased rabbits had died as a result of the infection, this is also a stark example of the perils of buying animals online for cash, from individuals who on occasions place profit before animal welfare. Sales through online platforms resulting in cash transactions and no receipts, mean no recourse for you in the event of a problem and almost pure profit for unscrupulous traders. The individual has been identified and referred to the City Council, HMRC and the RSPCA for further investigation and where necessary enforcement action. “I have also been involved in an enquiry relating to an alleged ‘vaccine’ for myxomatosis and RHD-2; this is apparently a homeopathic remedy that can also be used in different variants to treat canine, horse and feline ailments. “As per guidance published by the RWAF’s veterinary specialist on Twitter, there is no substitute for the genuine and approved vaccine. Homeopathic ‘vaccines’ are untested and are unlikely to provide the protection for your animals that the genuine veterinary medicines can. “The ‘vaccine’ is being investigated and the seller(s) will be referred to the Veterinary Medicines Directorate (VMD) for further enquiries. 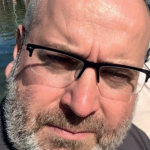 “Aside from these two major work-streams, I have also been maintaining my watch on internet sales platforms, building up a picture of the size and scale of online sales, helped by Hindesight’s sales monitoring software and the use of open source research tools”. 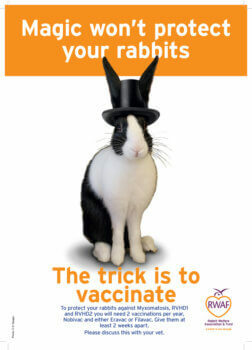 Is your vet rabbit savvy? Don’t leave it until you have an emergency to find a good vet for your rabbits. We have a ‘rabbit friendly’ vet list on our website. Do not give your rabbits to ice cubes as they can cause problems with their digestion system. Sun tan lotion is a no. They are likely to lick it off, and we have yet to see a rabbit with ear skin cancer. Instead, make sure you offer them plenty of shade, but if you are draping something over a run, make sure the air can circulate. Use of a battery operated fan on runs or enclosures can help. No need to change diet at all just, to stick to usual diet and make sure they drink lots by following the tips above. Access to a safe shady exercise area 24/7 is even more important in this heat as they will want to exercise when it cools down am and pm. If you’re on Pinterest please help discourage people from posting pins of trancing. We’ve been notified today that there’s a growing number of pins there from people who genuinely believe it’s okay which we as knowledgeable owners know it isn’t. 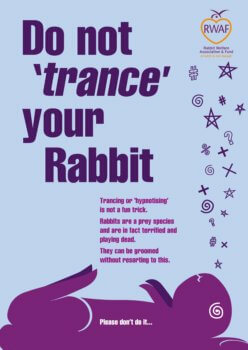 We’ve posted our Trancing posters on our own Health and Welfare board today with very clear messages, so if you’re a Pinteresteer (just made that up, you can probably tell!) please share our pins to help people understand that it’s a major welfare concern.